Trick-or-treating is a high-reward, low-risk undertaking. That’s why people in the U.S. are particularly spirited about grabbing their pillow cases and hitting the streets. In fact, FiveThirtyEight data shows around a quarter of Americans count Halloween among their top-five favorite holidays. And what’s not to love? For kids, it’s a time of shameless candy-binging and dressing up, and for adults, well, it’s much of the same. But depending on where you live, you could have a great trick-or-treating experience, with candy to last a year, or a negative one that leaves you with just apples and sore calves. The benefits of a great trick-or-treating town are more than just theoretical. Places with a high density of single-family homes, a low chance of rain and minimal crime will optimize your experience. That mirrors the reasoning financial advisors use to strategize your investments — to mitigate the risk of a washout while boosting sweet rewards. Below we take SmartAsset’s usual mathematical rigor to uncover the best places for trick-or-treating. To rank these locations, we look at data on housing density, housing stock, crime rates, percent of residents under 15 and weather. Check out our data and methodology section below to see where we got our data and how we put it together to create our final rankings. This is the fifth annual study of the best places to trick-or-treat. Check out the 2017 study here. This is Not a Trick – All of last year’s top three finishers took the top three spots again this year, just in a different order. Orem, Utah beat Nampa, Idaho and Kennewick, Washington to take the top spot. Get Your Candy in Illinois – Illinois has three cities in our top 10. In fact, the whole Midwest around Illinois is pretty good when it comes to trick-or-treating. 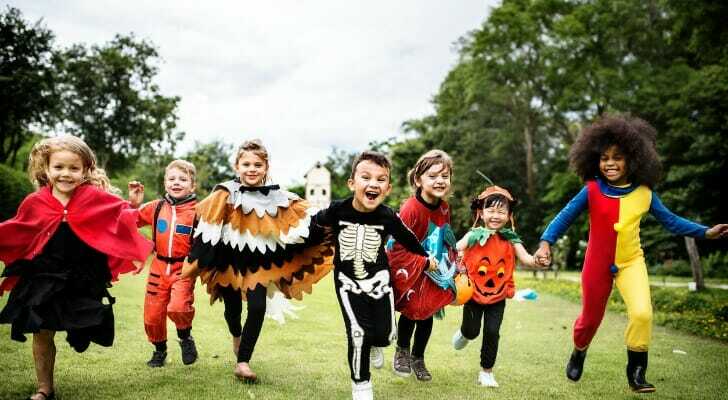 The region takes six of the top 10 trick-or-treating cities according to our data. If you’re looking for a great trick-or-treating experience look no further than Orem, Utah. This city has one of the highest percentages of children in our study, meaning there will be plenty of young people to trick-or-treat with. Orem is also one of the safest places to trick-or-treat with a violent crime rate ranking second overall. That means kids and parents can trick-or-treat till late without worry. The temperature in Orem around Halloween, just above 60 degrees Fahrenheit on average, is suitable for costumes of all type. Nampa, Idaho continues its hallowed Halloween tradition, securing another spot in the top two for the third straight year. This city scores well in every metric, specifically scoring no worse than 96th in any metric. The highlights to trick-or-treating in Nampa include its ideal weather. It almost never rains in Nampa during Halloween, and the temperature is usually around 58 degrees. This city is also slightly more affordable than Orem ranked above. Kennewick, Washington comes in tied for second. This city is great on Halloween, because it allows its residents to wear costumes of all types. Halloween temperatures in Kennewick are usually in the high 50s with little chance of rain. That means it’s probably cold enough that you won’t sweat through an elaborate layered costume nor cold enough that you have to cover up a simpler outfit. Costumes that rely on makeup also get the green light here, thanks to the aforementioned dry weather. Kennewick is also a child-friendly city with a low violent crime rate. Kennewick ranks in the top 15% of cities for percent of residents under age 15 and violent crime rate. Aurora has one of the highest densities of single-family homes in our study. The benefits of dense neighborhoods full of single-family homes are manifold. First, single-family homes tend to be the sweetest targets for trick-or-treaters. Second, a high density means less walking to hit the next candy jackpot. When you’ve been on the candy hunt for a few hours and your feet start to ache in those new cowboy boots, you’ll be happy the next house is only a short giddy-up away, especially as you lug your bag that is bursting with king-sized bars. And as you enjoy those treats, you won’t have to worry about many tricks. Aurora has one of the lowest property crime rates in our study. Dearborn is one of the youngest cities in our top 10. Specifically, about a quarter of Dearborn residents are under 15. This means both plenty of trick-or-treaters to celebrate with and an abundant supply of trick-or-treat-ready parents. Dearborn is also even more densely packed with single-family homes than Aurora, ranking 41st for that metric. The one downside to Dearborn is the threat of rain. Seeing precipitation in Dearborn around Halloween is not unheard of. Overall, this city ranks about average for historical chance of precipitation. Texas’ sole representative in the top 10 best cities to trick-or-treat is El Paso. This is an affordable city with low property crime rates and a low chance of rain. In each of those metrics, El Paso ranks in the top 40. While many residents in northern states may worry about cold temperatures on Halloween, in El Paso it is the heat you have to look out for. El Paso around Halloween has historically averaged about 70 degrees. Any hotter than that and you may find yourself sweating through your makeup and costume. Illinois is a clear front-runner for best states to trick-or-treat in. In seventh place is Elgin, Illinois’ second of three representatives in this top 10. Elgin is the second-safest city in our top 10, factoring in both property and violent crime. In particular, property crime here is rare. Elgin ranks second for property crime rate per 100,000 residents, according to FBI data. Trick-or-treaters who are into Halloween for the candy, come cold or high water, will find Racine, Wisconsin a desirable city. Racine has the 18th-highest density of single-family homes in the study and ranks number one for that metric in the top 10. That gives it one of the highest candy bars-per-square mile rates in the nation. Of course, as any financial advisor will tell you, to get the most candy you have to take some risks. And trick-or-treating in Racine is certainly risky business. In particular, those who are easily spooked by the chills may want to watch out. The average temperature in Racine around Halloween is just over 53 degrees, the coldest in our top 10. In addition, thunderstorms here are more than a remote possibility in October. Historically, there is nearly an 8% chance of precipitation in Racine around Halloween. In ninth is another Illinois city. Joliet is a city with plenty of trick-or-treaters and very little crime. Parents who send their kids out to trick-or-treat can do so mostly at ease. This city ranks in the top 25% of cities for both violent crime and property crime. Furthermore, about 22% of residents in Joliet are under the age of 15. Finally, Olathe, Kansas takes the last spot. Olathe, along with Joliet, jumped up from 11th to secure its top 10 spot. 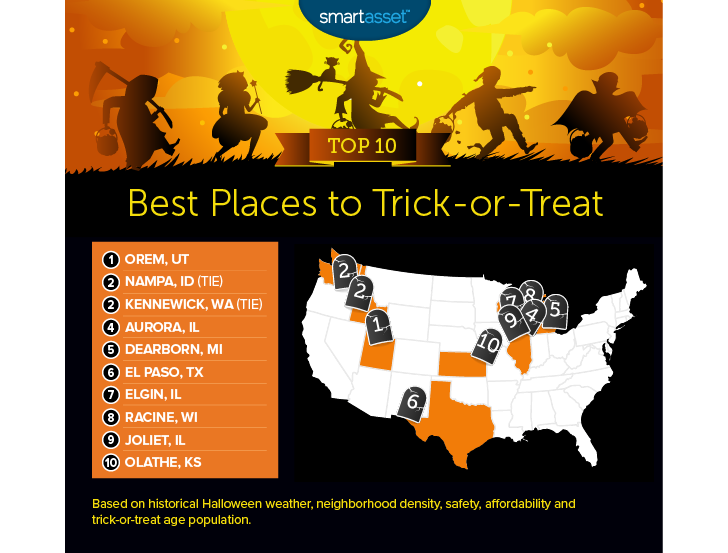 If safety is your primary concern, Olathe, Kansas is your best trick-or-treating spot, among the top 10 contestants. This city ranks 23rd and third, respectively, in violent crime rate and property crime rate. This city also has plenty of fellow trick-or-treaters, meaning no one will have to search for candy alone. One of the bigger downsides to Olathe, though, is the relatively low density of single-family homes. This city ranks low in that metric, meaning kids will have to log the miles in between trick-or-treating at single family homes. Single-family housing density. This is the number of single-family houses per square mile. Data comes from the Census Bureau’s 2016 1-Year American Community Survey. Percent of residents aged 14 or younger. Data comes from the U.S. Census Bureau’s 2016 1-Year American Community Survey. Violent crime rate. This is the number of violent crimes per 100,000 residents. Data comes from the FBI’s 2016 and 2015 Uniform Crime Reporting database as well as local police departments’ websites. Property crime rate. This is the number of property crimes per 100,000 residents. Data comes from the FBI’s 2016 and 2015 Uniform Crime Reporting database as well as local police departments’ websites. Average temperature. This is the average maximum temperature on October 31. We compared the average maximum temperature to 60 degrees Fahrenheit (what we decided was the ideal trick-or-treating temperature). Data comes from the National Oceanic and Atmospheric Administration. We ranked each city in each metric. Then we found each city’s average ranking, giving equal weight to each metric. Using this average ranking, we created our final score. The city with the best average ranking received a score of 100 and the city with the worst average ranking received a 0. Use the right account for your situation – Depending on your situation, whether you are saving for retirement or just building up an emergency fund, it’s important you use the right tool for the job. For example, if you need quick access to your funds, a high-yield savings account is probably your best bet. If you are thinking more medium-term maybe a CD is right for you. And finally, for the long term investing in the stock market offers the best returns. Talk to an expert – No matter what you are doing with your money it’s important to get the best advice. A financial advisor can help you decide if homeownership is right for you or if you should focus on retirement. If you are wondering where to find a financial advisor look no further than SmartAsset’s financial advisor matching tool. It will match you with up to three local financial advisors who fit your specific investing needs.